Methamphetamine is a synthetic stimulant drug which induces a strong feeling of euphoria and is highly psychologically addictive. 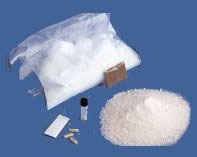 Pure methamphetamine is a colorless crystalline solid, sold on the streets as glass, ice, or crystal. It is also sold as less pure crystalline powder called crank or speed, or in rock formation termed tweak, dope, or raw. Illicit methamphetamine comes in a variety of forms. Most common it is found as a colorless crystalline solid, sold on the street under a variety of names, such as: crystal meth or crystal, glass, ice or Tina. Methamphetamine found on the street may be pure, or adulterated with chemicals that were used to synthesize it. In some instances, it may be diluted or cut with non-psychoactive substances like inositol. In other instances, it may be mixed with other psychoactive drugs. Methamphetamine is a highly psychologically addictive drug. The mental and social consequences of quitting can be severe and extremely difficult for the addict. As with all addictions, relapse is common. Former users have noted that they feel stupid or dull when they quit using methamphetamine. This is because the brain is adapting a need for methamphetamine to think faster, or at what seems to be a higher level. Very serious long-term meth abuse correlates highly with poor hygiene and general self-care, and many of the health risks inherent in administering the drug are often severely exacerbated by this. Poor hydration and infrequent dental hygiene strongly increase the risks of damage to teeth from smoking or snorting, while infrequent bathing increases the chance that minor skin rashes or irritations on the arm from needle use will progress to infection and complications. Generally poor maintenance of living conditions can increase the general risk of exposure to illness through a wide variety of malaise-causing agents, such as bacteria that may grow in poorly cleaned living spaces. Finally, if methamphetamine does in fact attack the immune system, it follows that the ability of the individual to resist any illness is compromised, and that heavy meth users, over time, become more susceptible to poor health and illness in general. Severe cases of addiction are often marked by many of these symptoms and hallmarks, which can work in combination to almost completely destroy the user's health.